And so goes the origin of the notorious friendship of Greg Sestero and Tommy Wiseau, two kindred spirits who were destined to bond, move to L.A., seek Hollywood prestige and pilot one of the most incomprehensible bad movies ever conceived. Yet somehow in the wake of that troubled production, “The Room” endured as a cult sensation amongst a wry assembly of fans, many of whom embraced the mysterious mess as an indictment of the elitist studio class system and an ironic rejection of conventional storytelling. Similar observations have followed a plethora of famous cinematic underachievers, but most have the benefit of zeal to drive their productions. To see Wiseau’s movie is to sense a strange dichotomy between how he forecasted his endeavor and how others absorb it; to laugh at the utter absurdity of the picture – intentionally or otherwise – is like poking fun where it may be unwarranted, towards a man who probably had sincere motives for his undertaking but not the mental or psychological capacity to sense his deficit for details (not to mention his sluggish exertion). I have carried those thoughts about “The Room” ever since it first graced my eyes back in the spring, and James Franco’s “The Disaster Artist,” a document about the manic undertaking of said travesty, does little to alter that perspective. One of the final scenes validates that nagging suspicion. During a lavish premiere for the film that caused so much mischief in their professional lives, Wiseau and his crew are seen under the projection lights in a flurry of mixed emotions relieved that the ordeal is over and mystified by what remains. His audience’s befuddlement meanwhile, gradually devolves into hysterical laughter, an inconsolable joy for inept results lumbering around on screen. The great Francois Truffaut found joy in seeing the faces of his viewers turned towards the light of the screen; here, he might have been stupefied by those grins of delight. But Tommy’s expression does not reflect the cheerful displacement of the others, and he is mortified by the reaction. Did he not see it coming? In a dramatic retelling that recognizes its unlikely hero as a loner tired of the betrayal of others, “The Room” was apparently a serious attempt at reasoning with the cruelty of the world. That underlying device fuels this projection for much of Franco’s affectionate film, which like “Ed Wood” and “Florence Foster Jenkins” is not so much about the terrible output of clueless artists as it is about the nerve that drives someone beyond the acknowledgment of their limitations. But what marveled me more than the chutzpah of the Wiseau persona – not to mention Franco’s own impeccable portrayal – was how insightful the material was when it came to the laborious creative process. The movie is filled with precious anecdotes we could not have anticipated. Consider, for example, a key scene when Tommy’s cinematographer Sandy (Seth Rogen) is struggling to get a good scene out of him on an apartment building roof, where the dialogue calls for him to mutter denials of abuse by his fiancée. On the 67th take, Greg interjects and offers Wiseau a water bottle to hold during the scene, providing him a distraction from the camera, and the next take is a victorious one. Given the reputation “The Room” has as an opus lacking seriousness or consistency, what a marvel it must be to know that even a terrible sequence came to pass with some level of focus. Others, including a famous love-making montage that showed a naked Tommy thrusting awkwardly while ontop of an actress, did not inspire as much patience; they were the result of ambivalent crew members rushing through scenes for the sake of finalizing a lengthy and exhausting production. The running gag is that everyone involved in “The Room” knew they were making a bad movie except for Wiseau himself, who wrote, financed and directed it with a vision known only to himself, often at the expense of explaining lapses in logic away with meaningless soundbites (“why am I talking about my breast cancer if it’s never mentioned again?”, one of his actress asks; “because it’s a twist!”, Tommy replies). If the material is as factual an account from Greg’s perspective as possible, however, that also implies some unfortunate inner-workings. If his dear friend was indeed a victim of an accident years prior, for example, does he see that as the source for Tommy’s lack of perception? Does that also explain his blatant insecurity, often manifesting on set when others seem to be getting far more respect from the crew? Frustrations spill over in a behind-the-scenes environment thick in mind games and jabs at self-confidence, with Wiseau unnecessarily directing anger towards others that might have been insufferable to those less admiring of him. Somehow “The Disaster Artist” makes this all a precursor to precious reveals towards the finale, when even our distant judgements are replaced with sympathy and respect, and Wiseau emerges not as tyrant but as a bruised force of nature, trying desperately to have his voice heard. In many ways I admire that approach; so many others would have gladly reduced this material to episodic exchanges ripe with parody and ineffectual melodrama. By undertaking this premise, Franco once again adds a notable notch to his strange career of successes and misfires by, basically, playing as unorthodox as his subject. What he sees, ultimately, is a thread of reasoning in Wiseau not unlike his own – that with a great sense of drive come the nagging voices of others who would stifle your motivation, leaving you to question your validity in a world that doesn’t seem to comprehend your capacity (or desire) to entertain others. Many remain thoroughly enamored by the ridiculousness of “The Room.” I will never among those devoted admirers. 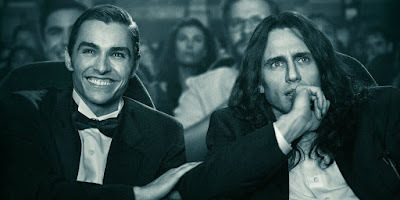 But “The Disaster Artist” recognizes this possibility as tributary; it functions primarily as a thoughtful, deeply humorous portrait of a man who wanted to make a movie in spite of the cynicism of others, and did so entirely on his terms – in this case, for far worse results than most. If Franco senses something admirable about that prospect, it is no wonder; like an engine without limits to fuel, he is a man who has made a plethora of strange and exhilarating career choices, seen great success from them and even colossal failure. He is as fearless as he is driven. One would not be out of place to suggest that Wiseau might be the muse he was destined to channel, just as Tim Burton too found a kindred soul in Ed Wood. Just as all great art is born from a mind that is intensely focused, a famously bad film is usually the result of an unwillingness to compromise the bizarre. Note: My review of Wiseau's "The Room" can be found here.